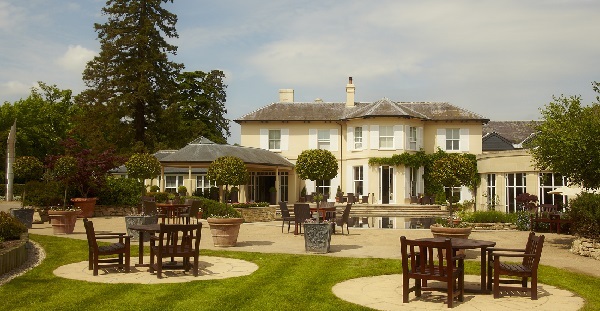 You don’t have to be a wine buff to enjoy The Vineyard Hotel at Stockcross (Berkshire), but it helps. The point is made as you enter the lobby to be confronted by hundreds of bottles arrayed in a glass-floored wine vault alongside the reception desk. 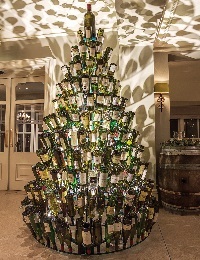 If you are there in time for the festive season, it is reinforced further by a Christmas tree composed of 321 (empty) bottles, with a magnum playing the role of the fairy on top. It’s hard to get away from the main theme, and who would want to, but surrounding this large-scale homage to the power of the grape is a 5-star place to lay your head with all the trimmings its status suggests. They range from multi-course tasting menus and real milk in the mini-bar fridge to a lavish and award-winning spa with pool and 24hr gym. Like London’s V&A, which once advertised itself as “an ace caff with quite a nice museum attached”, this is an ace wine shop, albeit of lavish proportion, with a luxury hotel attached. Having survived the temptations of the lobby and bolstered by the efficient welcome, BTN was led along hushed corridors to its appointed suite, No 218, named like all the other 31 suites and 17 bedrooms in the hotel for wines, in this case Domaine Roulot. Features included plenty of space in which to work and relax, free wi-fi, a balcony overlooking peaceful grounds, fruit plate and a welcoming letter from general manager Paul Shanahan. REN toiletries – body wash, body cream, shampoo, conditioner – in the bathroom plus vanity kit, slippers and bathrobes were a nice touch. But back to the wine and how it led to the creation of the Vineyard. Central to the story is a famous, or infamous depending on your point of view, event in Paris in 1976. Prosaically it was announced as the Paris Wine Tasting of 24 May. It became known instead as The Judgement of Paris and, as the history tells it, one of the most pivotal moments in wine history. A blind tasting of French and Californian wines, it changed the future of winemaking forever when the unknown Californians were chosen over some of France's finest by some of France’s top wine aficionados. Organised by British wine merchant Steven Spurrier, the tasting saw Californian chardonnays and cabernet sauvignons go up against the white Burgundies and Bordeaux reds of France – and triumph. The event transformed the industry. In particular, it inspired British businessman Peter Michael to set off on a journey to California in search of a suitable location for a vineyard of his own. He found it in 1982, starting the Peter Michael Winery in Knights Valley, Sonoma. What better showcase for his wines after that than to open a hotel where guests could sample the fruits of the vineyard’s labours, among others? In 1998, Michael, who in between times had been knighted by the Queen in 1989 for his contribution to British industry and was now Sir Peter, opened the Vineyard at Stockcross, near Newbury, with the aim of establishing the UK’s leading wine hotel. It has been privately owned by the Michael family ever since. Along the way, among his other achievements, Sir Peter in 1992 also found time to set up Classic FM, the UK’s first national commercial radio station. The hotel now boasts some 30,000 bottles of wine spread between the glass vault in the lobby and in the complex of redolent cellars beneath, a conducted tour of which is a highlight of a stay. The collection, overseen by head sommelier Romain Bourger, includes more than 800 Californian labels, many from Sir Peter’s vineyard, plus examples from elsewhere – including France but also the up-and-coming India and Far East vineyards. Meanwhile, the story of the Paris tasting lives on. 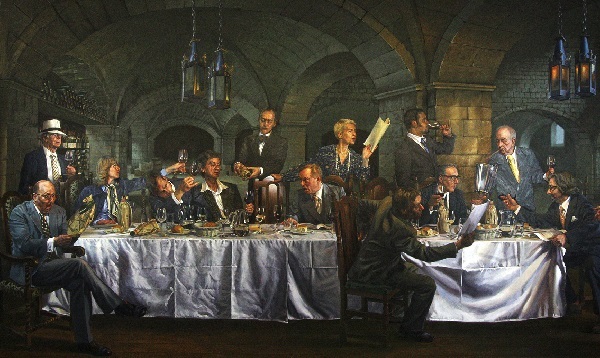 The hotel’s impressive art collection includes a huge canvas of the 1976 gathering commissioned by Sir Peter in honour of the event and unveiled on its completion by Steven Spurrier. Sir Peter, though not present at the Judgement, is featured in his trademark white hat on the left of the painting. This in turn leads on to another of the Vineyard’s special features, in which guests can recreate the Judgement with wines matched to each of seven courses on a tasting menu prepared by British chef Robby Jenks. Traditionally a French and Californian glass are served blind with each course and each diner decides which he or she prefers. I couldn’t tell whether the wines at the BTN dinner were tweaked, but the Californian won every time, with Sir Peter’s own 2014 L’Esprit des Pavots particularly memorable with the venison loin in Course 5. Other menu treats included oak-smoked Loch Duart salmon, soy and treacle tuna and a dessert of salted caramel with single-origin dark Manjari chocolate and Tonka bean. Returning to the suite, we find two glasses of 1985 Smith Woodhouse port as a night cap and wishes for a peaceful rest. It’s that sort of place.